BTW, congratulations on your new expected grandchild. 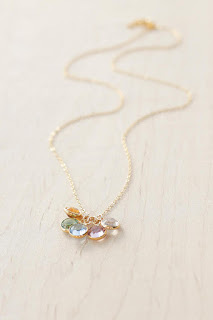 What a beautiful necklace and keepsake! Truly a very thoughtful gift and something you can wear daily and think of your grandbabies. Sounds like you have a very sweet daughter-in-law. That alone is quite a blessing! Wow those are so beautiful - these kind of gifts are the best, they can be passed down for generations, beautiful. Such a thoughtful and loving gift. A wonderful way to keep your grandchildren close to your heart every day. Those are lovely. I think any grandma would love such a necklace. Even us aunties might like one to always remember our nieces and nephews -- in my case, nephews. Great reminder to pray for them. What a lovely idea for a wonderful grandmother's gift. I know I'd love one and they would be easy to add more grandchildren to as well. 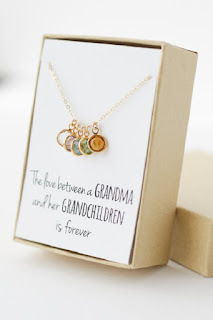 What a lovely thoughtful and beautiful gift for your favorite grandmother, grammie, nana, or Oma!